With the misinformation about Respawn Zones present in the forging community today, this article is a refreshing look at the Respawn Zone from a simple perspective, based upon the scientific approach of asserting official documentation. It is the intent of this article to present Respawn Zones in their true simplicity and intended use. Once an accurate understanding of Respawn Zone behavior is grasped, the forger can forge into a map his desired spawning experience with complete predictability. By predictability, I do not mean that the forger will know when each player shall spawn on each respawn point. But, rather, that his expectations shall be fully enforced (e.g., a player cannot spawn in the enemy base). While much work went into making this document as terse as possible, emphasis was placed on depth and explicit text to eliminate ambiguity. This article may seem a long read, but it will provide the reader with an unparalleled understanding of the Respawn Zones and their roles in forging the spawn experience that can result in a fully predictable design. The reader is also encouraged to look at the other articles I have written to compliment this article. These include Invasion Spawn Tutorial - a look at how the Invasion spawn engine works; Respawn Zone anomalies, - an article that covers the known anomalous behaviors of the Respawn Zone (e.g., Stock Pile zone); Conditional Respawn Zones - a look at enabling or disabling certain Respawn Zones during CTF or Assault; and Known Bugs With The Spawn Engine - a list of known bugs in the Spawn Engine, what we know about them, how we determined their existence, and any known work arounds. Respawn Zones, also known as Strong Zones, apply a massive positive weight to Respawn Points within their volume. This weight is so great that it would require a tremendous amount of negative influencers to match it and overcome it. Terms: For the remainder of this article, Respawn Zones shall refer to all three classes of respawn zones collectively, while Strong Zones shall refer to only those zones titled in Forge as Respawn Zone, and shall not refer to either Weak Respawn Zones, nor Anti Respawn Zones. The Line Of Sight (LOS) cone influencer alone is capable of matching the weight of a Strong Zone in only some cases . Apart from the LOS influencer, no other combination of negative influencers is known capable of overcoming the Strong Zone’s influence. A Strong Zone literally moves its Respawn Points into a weighting class all of their own. This is why it has been said that Strong Zones define hard boundaries for a team to respawn in. To force a player to respawn outside his team’s Strong Zone, every team compatible Respawn Point within the Strong Zone must either become obstructed or have its weight reduced below one or more available Respawn Points outside the Strong Zone. To eliminate this possibility from occurring, the forger merely need to include plenty of Respawn Points strategically positioned within the Strong Zone so that no combination of obstructing and LOS aiming can prevent the entire enemy team from respawning within their Strong Zone simultaneously. According to Bungie, Strong Zones do not alter their applied weights upon Respawn Points within their volumes due to enemies, allies, deaths, or any other conditions within their volumes, immediately external to their volumes, or due to any condition within any other type of Respawn Zone on the map. Their only behavior is to add a flat and constant weight to every Respawn Point within their volume. Since the Respawn Points within a Strong Zone are in a weighting class all of their own such that no Respawn Point outside the Strong Zone has any hope of competing for selection by the spawn engine, then it follows that two disparate Strong Zones assigned to the same team in effect form a singular collection of Respawn Points in this uber weight class, as though they were all within one Strong Zone. It is not which Strong Zone a particular Respawn Point belongs to that the spawn engine considers, but rather the total weight applied to the Respawn Point. Though they apply overwhelmingly strong positive weights to Respawn Points, Strong Zones never combine their weights with each other. 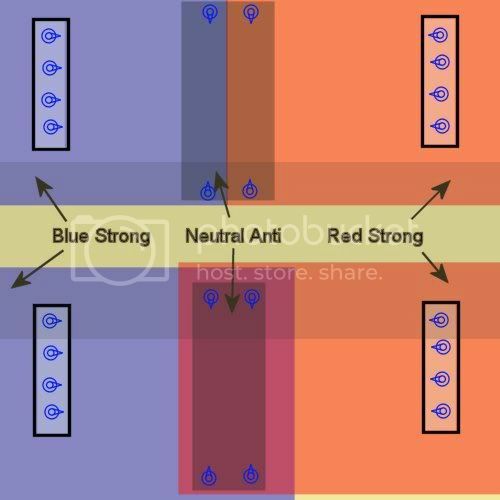 This is why covering the whole map with a neutral Strong Zone invalidates any team assigned Strong Zones that cover only parts of the map (e.g., red half v blue half). The neutral Strong Zone will qualify all Respawn Points on the map with the same weight for all players, regardless of team assignment, while the red Strong Zone does not add any additional weight for red team players – it won’t combine its weight with the neutral Strong Zone. Strong + Weak > Strong. Therefore, a better definition that will help you understand how to use Strong Zones would be something like, a zone whose boundaries define such strongly weighted Respawn Points that their exclusive use in respawning is an absolute certainty, so long as at least one of them is available for use by the spawn engine and has not been driven down too low by LOS influencer. Weak Respawn Zones are Respawn Zones that add the weight of approximately one teammate standing near a Respawn Point to all available Respawn Points in the Weak Respawn Zone, according to Bungie. Terms: For the remainder of this article, Weak Respawn Zones shall be referred to as Weak Zones. According to tests, this weight is between one and two teammates standing near a Respawn Point, most likely just a little more than one. The weights of Weak Zones combine within the intersections of their volumes only if those intersections are also intersected by Strong Zones. Since Weak Zones add a weight to a Respawn Point that is just a bit more than that of a teammate’s proximity, using a Weak Zone is a forger’s way of making the Respawn Point more preferential in comparison to any Respawn Point that is in proximity to a teammate anywhere else on the map. Weak Zones are the means by which a forger can tell the spawn engine that certain Respawn Points are preferred over others for the purpose of working with his design, rather than just following a pre-established set of algorithms. According to Bungie, Weak Zones do not alter their applied weights upon Respawn Points within their volumes due to enemies, allies, deaths, or any other conditions within their volumes, immediately external to their volumes, or due to any condition within any other type of Respawn Zone on the map. Their only behavior is to add a flat and constant weight to every Respawn Point within their volume. Take everything said about Weak Zones and apply them to Anti Respawn Zones, only with a negative weight. Instead of “preferred”, insert “deterred”. Terms: For the remainder of this article, Anti Respawn Zones shall be referred to as Anti Zones. According to Bungie, Weak Zones and Anti Zones combine weights when their intersections intersect Strong Zones, according to the following equations. According to Bungie, only a Weak Zone and an Anti Zone combine weights when their intersection does not intersect a Strong Zone, according to the following equations. While Bungie has not confirmed at the time of this writing, tests strongly suggest that the previous rules are erroneous and that Anti Zones do combine weights even in the absence of a Strong Zone, just as they would within the intersection of a Strong Zone, according to the following equation. And as you would expect, adding Weak Zones and Anti Zones effectively feather the weights applied to the Respawn Points within additional values to give preference or deterrence for the spawn engine’s consideration. Strong Zones say you want to confine a team’s respawn to the zone, with the condition that at least one Respawn Point within the Strong Zone must be available for use by the spawn engine and not driven too low by LOS influencers. Weak Zones say you really want to respawn here. Two Weak Zones say you really, really want to respawn here. Anti Zones say you really do NOT want to respawn here. Two Anti Zones say you really, really do NOT want to respawn here. According to Bungie, it is useless to know specific weights applied by influencers without having their tools, and their tools do not come with the game CD. For this and other reasons, Bungie does not publish the weights. According to Bungie, when the spawn engine detects a tie among Respawn Points for the highest weight, the spawn engine adds to each a tiny random value for the purpose of breaking the tie. This random tie breaker is also the reason that we observe what appears to us as apparently random locations used for respawn over the duration of the game. The only thing Anti Zones do is drive down the weights of Respawn Points inside them. Without dynamic influencers present, Respawn Points outside the Anti Zone will always be selected for respawn due to their higher weight. This means that the only time the Respawn Points within an Anti Zone are selected by the spawn engine is when negative dynamic influencers drive the weights of other Respawn Points lower than those inside the Anti Zone. In this section, I will give a few examples of how Anti Zones can be used. But I use these examples only for illustration purposes, to drive home the point that the Respawn Points within Anti Zones are used to deter respawning for the general case. By no means are these the only applications of Anti Zones a forger can come up with. Since negative dynamic influencers are best described as “danger zones” due to combat conditions, we can conclude two things. First, an Anti Zone can be used to convey to the spawn engine that the Respawn Points within an Anti Zone are in a danger zone by design (e.g., they are in the open). The spawn engine would have no other way of knowing, for example, that the forger intends to include a Scorpion or Banshee that can threaten open field spawning across The Canyon. Second, the forger can anticipate the spawn engine to use those Respawn Points within an Anti Zone when the Respawn Points outside the Anti Zone come under fire. 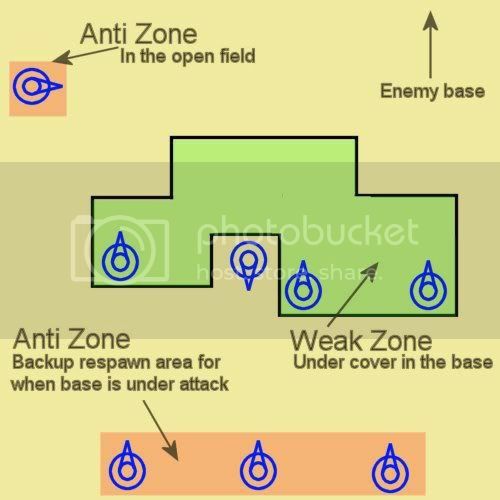 The use of the Anti Zone is a way for the forger to designate a group of Respawn Points as an alternate place to safely respawn in the event that the primary Respawn Points (e.g., in the team base) comes under fire. In a scenario like this, the alternate Respawn Points that are covered with an Anti Zone are at a distance from the team base, usually along the maps’ periphery. By definition of their limited weighting, team assigned Anti Zones are NOT designed to prevent a player from respawning in their enemy’s base. That is the role of team assigned Strong Zones. Additionally, on many maps, such a use of Team assigned Anti Zones can be thwarted by driving all other Respawn Points lower in weight by using massive negative influencers. Tests have shown that the combination of 10 Anti Zones can be overcome by the death influencer in a simple suicide. By using the Anti Zone as the tool in an attempt to prevent players from respawning in their enemy's base, the forger cannot reliably predict that there will always be at least one Respawn Point else where on the map that will have a higher weight. Finally, another use of the Anti Zone is to reduce back to zero the applied weight of one or two Respawn Points in a sea of Respawn Points blanketed by a Weak Zone. In a complex structure, this may be an economic way to utilize the various Respawn Zones to affect the desired spawn experience. The same can be said with using Weak Zones to fine tune a few Respawn Points that are in a much larger Anti Zone, though in practice this is probably less likely to be the case. The only thing Weak Zones do is drive up the weights of Respawn Points inside them, to effectively prefer respawning within them. By proper application, the forger uses Weak Zones to inform the spawn engine which specific areas of his creation are desirable areas in which to respawn. The spawn engine would have no other way to know. The forger can use Weak Zones to prefer respawning in areas near high value objects, such as power weapons or vehicles. The forger might also use Weak Zones to prefer respawning in safe areas, such as inside and under cover of the team base. Because Weak Zones will draw a player away from an opportunity to respawn near a teammate, care must be exercised. It becomes the responsibility of the forger to ensure that a Weak Zone does not draw a player into a firefight or near to an enemy due to the artificial weight that the Weak Zone represents. It is quite easy for a Weak Zone to respawn a player in his base facing the back of an enemy who is camped in the player’s base. Without the enemy facing the Respawn Point, the negative weight of his proximity to the Respawn Point may not be enough to overcome the Weak Zone to force the player to respawn elsewhere. Finally, we know that respawning near a teammate is more ideal than respawning away from teammates, because a teammate’s proximity adds weight to Respawn Points. A Weak Zone is just a little more than a teammate’s proximity weight. Using a Weak Zone is telling the spawn engine that the area covered by the Weak Zone is a bit more favorable than respawning even near a teammate. As a forger, you must decide if that is true or not every time you lay down a Weak Zone on the map. Bungie stated that a Weak Zone applied about the same weight as a teammate nearby. Experimentation shows that this weight is just a little more than that of one teammate. But it is also less than that of two teammates. 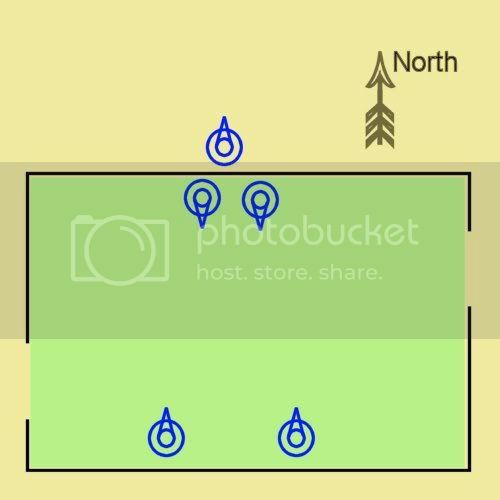 Consider the case where a room is covered with a Weak Zone, and has four Respawn Points inside the room and one just outside the room. Now let’s say that a Falcon gets shot down with three teammates on board. They all die at the same time. They respawn nearly simultaneously. The four Respawn Points inside the room are the highest weights on the map. The first player respawns on one of the Respawn Points inside the room. The spawn engine randomly selects one of the two along the north wall. The second player will respawn inside the room as well, as close to the first as possible, also along the north wall. Now the third player must respawn. But instead of respawning in the safety of the room along the south wall, he respawns outside on the Respawn Point closest to his two teammates. The spawn engine does not know there is a wall there, or even what the implications of that wall could mean to the game play. But the forger does. And the forger needs to ensure that the spawn engine does not allow the proximity of the Respawn Points to cause unintended respawns during the game. One way to correct this problem is to double up the Weak Zones (assuming there is a Strong Zone covering that portion of the map). However, this solution compounds the problem by driving players to respawn in their base with even greater disregard to potential scenarios involving enemies camping in the base. The correct solution is to move the Respawn Point on the exterior of the building away from the Respawn Points inside the building so that teammate proximity cannot be used to prefer the exterior Respawn Point over the safety of the interior of the room. Typically, maps use team assigned Strong Zones so that the red team has one half of the map to respawn on and the blue team has the other half. This prevents, for example, a blue team member respawning right by the red team flag in the red team base. For larger maps, each teams’ Strong Zone can cover more than half; say, two thirds of the map each, with them sharing the center third of the map as a valid respawn area. This offers more opportunity to avoid spawn killing by increasing the number of Respawn Points available to each team, while it also prevents players from respawning inside their opponent’s base. A neutral Strong Zone covering the entire map can also be used to optimize the application of Strong Zones for multiple game types. Say a map supports slayer, flag, bomb, and territories. You want to divide the map in half between red and blue team for use by Territories, Flag, and Bomb. You use only two team assigned Strong Zones to do this and you match them to game type TEAM_ONLY. But for Slayer you want to employee dynamic spawning, where once the game begins, it doesn't matter where any player respawns. (Dynamic spawning is controversial. Since there are no objectives to protect, the emphasis is to respawn in the safest possible place on the map, even if that is in the enemy base.) You can blanket the map with a neutral Strong Zone that matches to game type SLAYER, essentially removing the effects of the red and blue Strong Zones for Team Slayer games. This design strategy requires only three Strong Zones on the map in total. (update) However, there are a couple of things to keep in mind when using a neutral assigned Respawn Zone. First, make sure you set it to FFA_ONLY and the GAME SPECIFIC property to TRUE. Otherwise, unlike a team specific assigned Respawn Zone that can only match a team even when it is spawned on the map for FFA games, the neutral assigned Respawn Zone will be enabled for any game, not just FFA games alone. Second, Stock Pile will enable the zone, making it incompatible with the Stock Pile game type. Let’s go back to the scenario where a map has two Strong Zones, one for red team and one for blue team, with each Strong Zone covering half the map. Within those team assigned Strong Zones, you can add neutral Weak Zones or team assigned Weak Zones to give preference to, say, Respawn Points in the team base. Either neutral or team assignment will work, as each team should only be capable of respawning on their side of the map in the first place. 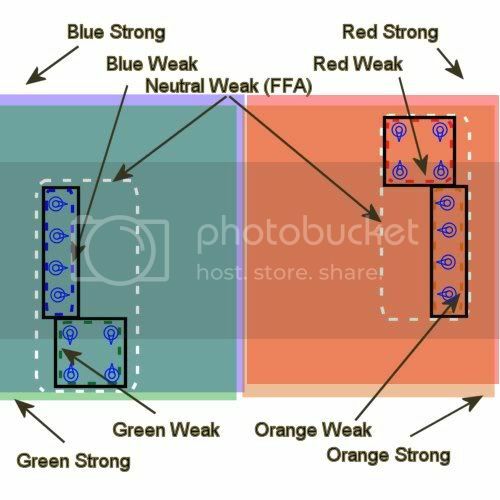 However, using neutral Weak Zones allows those same Weak Zones to be used in FFA games, while using team assigned Weak Zones prevents their use in FFA games. There are times when you want to give Weak Zones a team assignment. If you design a map with two primary bases, you can design the map further for four teams (red, blue, green, orange) or even six or eight teams. These are unusual, but it can be done and done well. Typically a map is divided in half. One half is covered with a blue Strong Zone and the other half covered by a red Strong Zone. Now the same region that is covered with the blue can also be covered with a green Strong Zone. The same is true with an orange Strong Zone covering the same region as the red Strong Zone. This way the map still functions as anticipated with two teams, but can accommodate 4 teams. Now you can give the blue base more than one Weak Zone apart from each other, one for blue and one for green. These Weak Zones are NOT neutral for this scenario. Same is true for red and orange. Now you may ask, "Why not just use team assignments for Weak Zones and Anti Zones all together?" Because in FFA, a neutral Weak Zones and Anti Zones can be used to prefer or deter spawn points by the spawn engine as well as the team whose Strong Zone overlaps the Weak Zones and Anti Zones. Now that you have defined team Weak Zones, you will need to also define neutral Weak Zones for FFA if you want to support FFA. But you do not want the neutral Weak Zones to overlap the team Weak Zones or you will be adding additional weight to the team Weak Zones in team play. To avoid this pitfall, set the game type property for the team assigned Weak Zones to TEAM_ONLY, and the neutral Weak Zones to FFA_ONLY. Rocket Launcher on Forge World has been shown to overcome a Strong Zone’s influence. After consulting with Bungie, it was later discovered that there is a behavior pattern that has now been uncovered. I am trying to get Bungie to analyze this and get more information from them. It appears that LOS of many weapons on any map can overcome a strong zone if there are more team compatible spawn points outside the Strong Zone than in the Strong Zone. I intend to write another article to discuss this one influencer soon to discuss how to take advantage of this behavior. While LOS influencer from Rocket Launcher has been shown to overcome a Strong Zone’s influence, it is not clear if the game type impacts this influence to any degree. Also, excluding Rocket Launchers from a map cannot in itself prevent Rockets from appearing in the game, as the game type can choose to arm players with Rocket Launchers as their primary or secondary weapon.